I’m going to go ahead and assume that most parents of young children in America have seen the recently released movie Inside Out, so I won’t bother yapping about spoiler alert. Like Disney’s Frozen, this movie depicting the psychology behind emotions and memory has taken us by storm. Unlike Frozen however, Inside Out has some major melodrama that I can get behind. Let’s put aside the fact that the main character, Riley, only had five emotions- Joy, Fear, Anger, Disgust, and Sadness. Obviously, we are capable of experiencing a huge range of different emotions; not just these five. But for the purposes of this blog, I will spare you all my critiques of how this movie didn’t get it right. Let’s move on to the ways that it nailed it. The main theme that I took from this movie was what the psychological community calls emotional congruence. This term basically states that what you’re feeling (your emotions) should match what you’re presenting (your behavior). For example, if you’re feeling happy about something, you may smile or laugh. If you’re angry about something, you may furrow your brow or frown (or go sit in your closet and scream into a pillow… No? Okay, never mind about that one). Point is, when Riley goes into her new classroom and feels a normal, healthy mix of excitement and fear, nothing bad should’ve happened. She may have stuttered in front of the class, spoken too quietly for anyone to hear her, or felt a little nauseous at the presence of those feelings. Let’s also not forget the sadness that she feels at the loss of her former life. But what does Joy go and do? Banishes Sadness to the corner and tries with all her might to keep Riley the “brave and happy girl” that her parents need her to be. This is where all of Riley’s internal emotions start to go haywire- when what she was feeling inside wasn’t congruent with the situation with which she was faced. Think about the way you may react to your child feeling sad. Is your automatic response to say “don’t be sad”? Even if that is said in a sweet voice and accompanied by a bear hug, it may not be the phrase a kid needs to hear. Instead of trying to will your child out of sadness, or even attempting to fix the problem, try doing what Sadness did in the movie. When BingBong was upset and Joy failed to cheer him up, Sadness, knowing how important it was to be allowed to feel sad, just sat with him and patted his back until he felt better and was able to move on. She didn’t try to reason with him or explain why he shouldn’t feel sad or tell him to get over it. She just sat with him. Next time your kiddo is sad about something, just sit (or lay on the floor) with him or her. This super simple action acknowledges your child’s feelings and doesn’t undermine his or her expression of, in this case, sadness. Just take a second and imagine how you would feel if your spouse or bestie or whomever told you “Oh, don’t be so sad” or “Goodness, don’t cry!” Yes, thank you friend, that definitely makes me feel better. Right? Kids are told that all the time! Now, this is all assuming that you know your child well enough to distinguish between her being ridiculously dramatic and her being genuinely hurt about something (even if it seems silly to you). Let’s make a pact and change our automatic response from “don’t be sad” to “I’m so sorry you’re hurting”. It’ll change your life. Okay, maybe not yours, but definitely your kid’s. If you have kids (or pets, for that matter) then chances are that you have used some behavioral therapy techniques on them. Behavior therapy involves the use of reinforcement and/or punishment to increase a desired behavior or extinguish an unwanted behavior. Here are some practical pointers on using positive reinforcement (praise and point charts in particular) with your children. Much of this information was gleaned from Dr. Alan Kazdin (you can check out more of his materials here). The reinforcers increase the strength of the positive behavior. If they do not, you may need to choose different reinforcers. The reinforcer should occur immediately after the positive behavior. Your child must perform the desired behavior before receiving any reinforcers. For new behaviors to occur, the reinforcer needs to follow the behavior every time. Material Reinforcers: Tangible items such as toys, clothes, and candy. Privileges of Activity Reinforcers: Time together with the parent, slumber party, staying up late, chore done by the parent. Social Reinforcers: Your approval! A smile, a wink, a hug, and praise. Token Reinforcers: Items given to your child that can be exchanged for more valuable reinforcers. Deliver praise when you are near your child. When you are close to your child, you can be sure that the behavior you are praising is taking place. Also, when you are close, your child is more likely to pay attention to what you are saying. Use a sincere, enthusiastic tone of voice. You don’t need to be loud, but make sure that you sound thrilled about what your child is doing. Use nonverbal reinforcers. Show your child you are pleased by smiling, winking, or touching. Hug your child, high five him, or pat him on the back. Be specific. When praising your child, say exactly what behavior you approve of. “Wow, thank you so much for picking up your shoes and putting them in the closet.” You want to be specific. Remember to praise and give points immediately after the desired behavior. Review the chart with your child at the end of every day. This gives you a chance to praise the number of points accumulated that day and review all the positive things your child has don’t to earn the points. Also, when few points have been earned, it gives you a chance to handle it neutrally and encourage your child to earn more the next day. Have some of the rewards available every day. Give rewards as agreed. Once your child has earned enough points to buy a reward, he should be allowed to receive it regardless of anything else that may have happened that day. Encourage your child to buy rewards each time. Remember, it is an opportunity to reinforce the behavior you are working on. 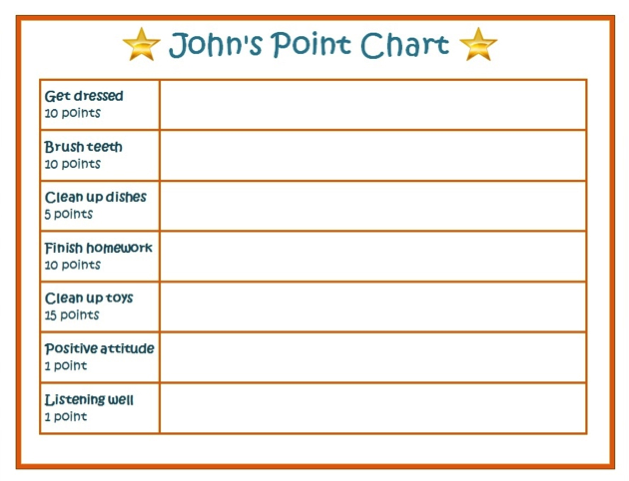 Bring the point chart to our sessions each week whether or not it is completed. That way we can track your child’s progress.